To say that King George IV and his consort, Caroline of Brunswick had never got on well would be an understatement. The two separated soon after their wedding, but never stopped trying to make life hell for each other. George, in particular, was keen on getting rid of his wife and tried several times to divorce her or annull their marriage, but without luck. 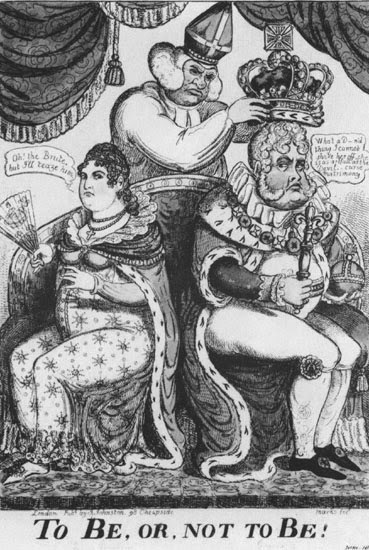 When he became King in 1820, he was adamant Caroline, who had technically become Queen, wouldn’t stand at his side. After trying to bribe her to stay away, but without success, he got Parliament to introduce the Bill of Pains and Penalties to dissolve the marriage. There was a trial, in which Caroline’s infidelity was proven. The bill was then passed, by a small majority in the House of Lords, but it dropped because of its unpopularity. 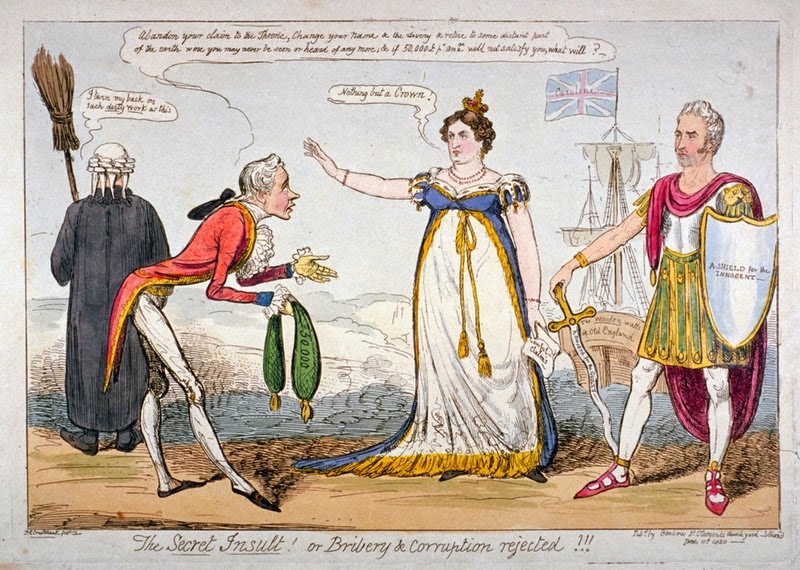 A large section of the press and public, in fact, were appalled at George’s behaviour and sided with his slighted Queen. Those who saw them before they were housed in Cotton Garden, describe them as swarthy, dirty looking fellows, in scanty ragged jackets and greasy leathern caps; at the bar of the House, however, they looked as respectable as fine clothes and soap and water could make them. To this a caricature of Robert’s, entitled, Preparing the Witnesses—a View in Cotton Garden, refers. 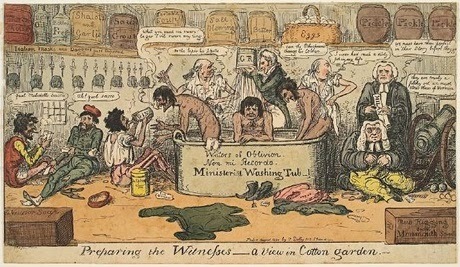 Three dirty foreigners are being washed, with no satisfactory result, in a bath labelled, “Waters of Oblivion,” “Non Mi Ricordo,”** and “Ministerial Washing Tub.” One of the operators (probably the Attorney-General, Sir Robert Gifford) remarks that “he never had such a dirty job in his life”; seated around are a number of equally dirty foreigners awaiting their turn.